The “Ides of March” is an interesting day. It is the 15th of March and it commemorates the assassination of Julius Caesar in 44 BCE. Why would anyone really want to remember something like that? But Caesar (you know who he was, right?) got himself stabbed to death at work (he was a senator). They say that there may have been over 60 people (lead by guys named, Brutus and Cassius) that were involved. The interesting thing to me is that Caesar was warned that this was going to happen; but, silly him, he went to work anyway. If someone told me that I was going to come to harm if I went somewhere later today, just for the heck of it, I would stay home. William Shakespeare (one of my favorites), made this prophecy famous in his play called … (of course)… “Julius Caesar.” In the play Caesar is warned by a soothsayer to “beware the ides of March.” Hence, the expression. For some reason this all made me think about dogs in Greek Mythology (OK, Caesar was Roman, but somehow I made the jump). 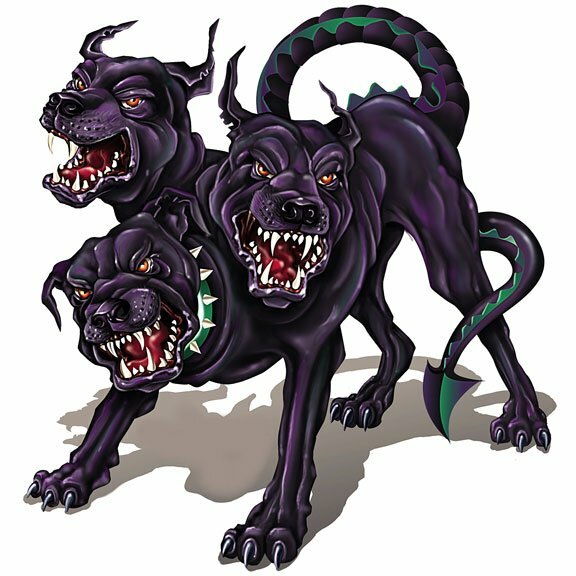 Which lead me to thinking about the three-headed dog, Cerberus. He was a watchdog. The difference between him and my Louise is that Lulu watches over my house, where Cerberus watched over Hades (also know as, hell, or the underworld.) He allowed people to enter but he never would let them leave. Some people did escape however, like Orpheus, who lulled him to sleep by playing soothing music, and Hermes who used water from the Lethe (a river that ran through Hades). The most famous ‘person’ who got past Cerberus was Hercules (I like him best in the Disney version). Actually, Hercules did not get ‘past’ Cerberus, he wrestled him into submission and brought him to the land of the living. And they say that Cerberus’ saliva fell to the ground during that encounter and that is what produced the first poisonous plants on earth. You never know where the ides of March will take you. Beware! I’ll probably have a nightmare tonight now! Oh – Sorry. Please don’t. Think about kitties and geese instead. That was interesting, Dogdaz. I’ll be on guard! It will be ok. Just Breathe. Thanks my friends. 3 Moggies – 3 heads – Oh My! Happy bday Dad. Behold the ides of Dad! Thank you for this educational post! I wondered where those poisonous plants came from! Who knew? TGIF!